Some clues about how Francis might approach such a unique consultation can be found in his interview with Fr Antonio Spadaro SJ for a group of international Jesuit magazines. The parts dealing with moral issues were widely reported by the world's press. For those who have taken the trouble to read the whole 12,000 words, there are some other surprising comments. Some have particular relevance, perhaps, to an incoming Australian Government with some of the cabinet well versed in Jesuit thinking and spirituality. The spirituality of the Jesuit founder, St Ignatius of Loyola, speaks of discernment, finding one's way through life according to what one understands to be God's will. Francis admits his style of government as a Jesuit Provincial at the beginning 'had many faults'. He did not always do the necessary consultation and was perceived as authoritarian. Just as Australians are watching how a new federal government consults and discerns, so Catholics world-wide will wonder how the Pope's Jesuit formation will influence this consultation with the cardinals. 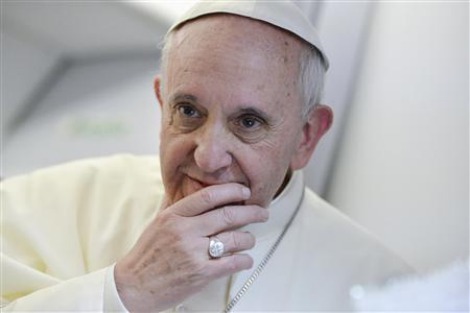 According to Pope Francis, 'uncertainty is in every true discernment'. Things are not always as they first appear. Wide and generous consultation with those most knowledgeable, usually those most affected, is essential. He rejects the approach of those who suggest that one should not consult too much — decide by yourself. Rather, it is through discussion that one arrives at the best decisions. The story is sometimes told among those involved in corporate governance of the board that was wrestling with a difficult problem. One member suggested bringing in an expert. Another was resistant until he knew what the expert would say. Those in positions of power need to give permission to their advisers to tell the truth. The worst thing you can do when consulting is to listen only to voices that please. The worst thing one can do when asked to give an opinion is to tell others what you think they want to hear. We trust that the cardinals will be able to say what they believe with humility and honesty. The fact that some have already engaged in a wide consultation among their constituencies is a positive sign. For Francis, discernment about issues that one faces, and problems to be solved, requires firsthand experience: 'When it comes to social issues, it is one thing to have a meeting to study the problem of drugs in a slum neighbourhood and quite another thing to go there, live there, and understand the problem from the inside and study it.' His advice to those who exercise power, and so presumably to himself, is to be humble and leave room for doubt. 'If one has all the answers to all the questions — that is proof that God is not with him'. The discerning leader will slow things down, be patient, gather the data, listen carefully to those who have something to say before making decisions. This is the exercise of authority and is not authoritarian. Francis admits that humans, in search of themselves, make mistakes. 'The Church has experienced times of brilliance, like that of Thomas Aquinas, but the Church has lived also times of decline in its ability to think.' He warns against confusing the genius of Aquinas with the age of decadent Thomist commentaries. 'Unfortunately, I studied philosophy from textbooks that came from decadent or largely bankrupt Thomism,' he says. He has defended himself against those within the Catholic Church obsessed with particular moral issues and insisting he speak more about them. He says explicitly, 'I have never been a right-winger'. This is not to say that moral truth is changeable at whim. Wrong is still wrong even when everyone is wrong. Predictably, some ecclesiastical voices were quick to explain that the Pope's interview was not meant to change Catholic teaching. Moral teaching is about what is good. Knowing what can and cannot change, with respect to particular actions, in particular historical circumstances, and in the light of new knowledge and understanding, is a real exercise in discerning the good here and now. The people itself constitutes a subject. And the church is the people of God on the journey through history, with joys and sorrows. Thinking with the church, therefore, is my way of being a part of this people. And all the faithful, considered as a whole, are infallible in matters of belief, and the people display this infallibilitas in credendo, this infallibility in believing, through a supernatural sense of the faith of all the people walking together. This is what I understand today as the 'thinking with the church' of which St Ignatius speaks. The group of cardinals has a unique opportunity and a serious responsibility helping Francis understand what the people of God are thinking and expecting. According to Fr. Spadaro, who conducted the interview with the pope (as per his Twitter): "The line 'I've never been a right-winger' means that he never supported Argentina's military junta." Which is to say that something apparently got lost in translation. While not wanting to rain on your parade here and being enthusiastic about other discussions you have reported Brian, I do need to note that even with the inclusion of the missing sentence, the pope's remarks about women and their role in the church are seriously wanting. Let's hope they develop more momentum with time. This approach is welcomed by the Eastern Churches who feel the church should be ran by consensus, rather then a centralized Vatican bureaucracy which has been proven to be self serving with little regard for the universality of Christ's church..
You really think, Cardinals will make a difference?? We have a Cardinal and he will make sure things go backwards! So much for Hope that things will get better. The haste to sanctify 2 Popes does not augur well. #Mr Hasse the Eastern Church critique needs nuance given the enormous proliferation in East and West of local bishops conferences: http://en.wikipedia.org/wiki/Catholic_Bishops_Conference #Furthermore,ecclesial local autonomy is a festering problem in the oriental Orthodox churches: "Over the last half century [i.e. until 1991] few subjects have provoked so much controversy in the Orthodox world as autocephaly. ['independence'] One need only mention the unedifying disputes between the Russian Orthodox Church and the Patriarchate of Constantinople concerning the status of the churches of Poland, Czechoslovakia and America. Disagreement has centered on the way in which autocephalous status is attained. To put matters in simplest terms, according to the Russian Church, any autocephalous church has the right to grant canonical independence to one of its parts. According to Constantinople, on the other hand, only an ecumenical council can definitively establish an autocephalous church, and any interim arrangements depend upon approbation by Constantinople, acting in its capacity as the mother church and first among equals." — John Erickson, The Challenge Of Our Past, 1991. The lengthy interview Pope Francis granted Father Spadaro should not be seen as a motherhood statement. It enunciated very clearly his spirituality and vision for the Catholic Church. I suspect the result of his papacy will be a humbler, more spiritual and much more effective Catholic Church. The interview was not a prelude to his current meeting with the Cardinals although his spirituality and vision should infuse that. His experience as a teacher in Jesuit schools and the uniformly excellent accounts of him given by former pupils should be a clue of how he values and nurtures the young people who are, basically, the future of the Church. Some of those young people were horribly damaged by the worldwide, long lasting epidemic of paedophillia within it: something he would deplore. The Cardinals are, among other things, the Church's top administrators, responsible for implementing not just Rome's directives, but also the spirit in which they are meant. Are some of the Cardinals and those serving under them in important positions capable of cleaning the Augean Stables of paedophillia and seizing the Pope's vision and renewing the Church? What will happen if they are not? Is it just "business as usual"? That would be tragic. Are the cardinals in a position to tell the pope what the people think and expect? Anna clearly the present Pope [endowed today with 'twofold infallibility'-by nuanced office and global acclaim] the latter acculturated these days, maintains the value of his eminent G8 as 'in touch with' " what the people think and expect". In secular media His Holiness can do no wrong after all! Brian, you say "The group of cardinals has a unique opportunity and a serious responsibility helping Francis understand what the people of God are thinking and expecting." I would suggest people are thinking that 'truth and justice' would be a good start. As for Father John George, please desist from using big words, better still, say a lot less. In Rome and in Christian times people who took their own lives were buried outside the communal graveyards and without the prayers that farewelled the dead of the community. The symbolism was clear. They had separated themselves from society and its shared life; now society separated itself from them. And by implication it also marginalised those closely associated with suicide. Has much changed? Ever since Pope Francis stepped onto a balcony at St Peter's Basilica, his words have been abbreviated, deconstructed and turned into memes. The attention paid to last week's interview with the Pope, conducted on behalf of by major Jesuit journals worldwide, suggests that the Roman pontiff is still held relevant, even by those who regard religious institutions as anachronistic.